There are WAY too many ESO players posting suboptimal builds on forums that they haven’t extensively tested and optimized. They think their build is good just because they picked some good stats and items that they hear are good. If you’re serious about maximizing your characters full potential, you will need to spend hours testing and tweaking your build until you prefect it. Stamina DPS: The best choice at the moment is Redguard for PvE DPS. Since the Khajiit critical passive was fixed they have become a top contender for maximum Stam DPS. Tank: Nord is the best race for tanking because of their reduction to incoming damage and increase to stamina and health. Balanced: If you want a more well-rounded race so you can switch between multiple roles, you can pick Imperial. Healer: Breton, the reduced spell cost and high magicka pool is essential for efficient healing. Second best choice will be High Elf. Stats For Stamina Builds: To do end game content you will want around 18k HP (for non-tanks) so you don’t get one shot. After you make sure you have 18k HP you should dump all your extra stats from attribute points and enchants into stamina. If you are still leveling up just make sure you keep putting some points into health, if you start getting one or two shot that means you are putting to many points into stamina. Stats For Magicka Builds: You will also want about 18k HP for magicka builds if you are planning to do end game content and if you are still leveling just make sure you are putting enough points into health so you don’t get one or two shot by packs of mobs. Maximum DPS: Most characters should run the Thief mundus stone for maximum DPS but Khajiit Templars with a high critical strike chance should run Shadow. Optimal Tanking: The Lord is the best stone for tanking unless you have almost 30k HP fully buffed without it, then you should switch to the Tower for the extra stamina. Maximum DPS: The Thief is defiantly the way to go for magicka DPS builds, the Thief increases your critical chance which boosts your damage more than any other stone and allows you to use your ultimate more often. Optimal Healing: For healing builds you should swap mundus stones to the Atronach, the ability to consistently heal is way more important than your damage output. Your Champion points are going to vary based on your exact build, game content you are doing, whether you are going for single target or AoE damage, and group setup. Below we have put together some basic templates for you to start with and modify based on your needs. For Tanking & Healing champion point templates download our Templar Builds mini guide by clicking the link below, we didn’t include them in this post because it would be too long but we did add them to the guide you can get below. Your gear traits and enchants are going to change slightly based on what game content you want to do, who’s in your group, and various other factors. If you Get Our ESO Mastery Builds Guide we will show you what you need to change based on your situation. It covers group content, raids, and solo gameplay. **Note** We didn’t include item builds for tanking and healing in this post because it would be way too long, however we did include them in the downloadable Templar guide you can get by clicking the link above. 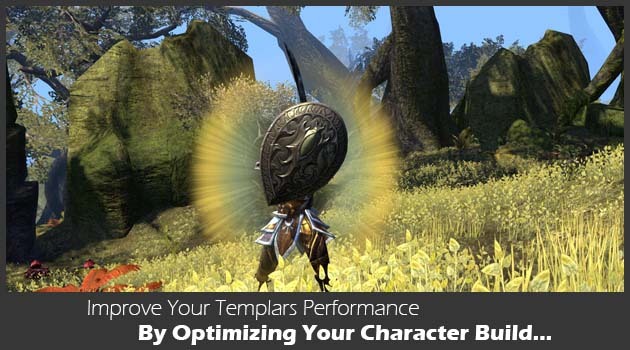 If you would rather skip all the work and just get a huge list of perfect build templates for all roles and playstyles, you should get our Character Builds Guide where we walk you through step-by-step how to copy the best builds within minutes and you can become one of the top Templars in The Elder Scrolls Online. The builds we offer in our guides are constantly updated and proven to maximize your characters performance in any role or playstyle. We have builds for PvE, PvP, Tanking, Healing, DPS, and builds for characters still leveling up.